Author Charlotte Abrams presents this proud family sketch early on in her memoir of life in Chicago with her sister and her deaf parents. Hers is a loving portrayal of how a close Jewish family survived the Depression and the home front hardships of World War II with the added complications of communication for her mother and father. Rich episodes detail history from a particularly acute point of view that entertain as they subtly inform. Her father, a former prizefighter, considered the gift of a radio an intrusion until he found that he could have his hearing daughters pantomime the Joe Louis - Billy Conn fight as it occurred. The Silents departs from other narratives about deaf parents and hearing children when the family discovers that Abrams’ mother is becoming blind. With resiliency, the family turned the secret, terrifying sorrow their mother felt at losing her only contact with the world into a quest for the best way to bring it back. Should she learn Braille? Should she use a cane? 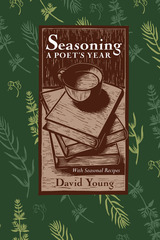 All of the old communication and day-to-day living routines had to be relearned. And through it all, the family and their neighbors, hearing and deaf, worked together to ensure that Abrams’ parents remained the close, vital members of the community that they had always been. The Jewish religion owns a virtually uninterrupted record of scripture and commentary dating back to 1,000 B.C.E. (B.C. ), portions of which allow the new book Judaism and Disability: Portrayals in Ancient Texts from the Tanach through the Bavli to document attitudes toward disabled people in the earliest centuries of this ancient culture. Abrams examines the Tanach, the Hebrew acronym for the Jewish Bible, including passages from the Torah, Prophets, and Writings, and subsequent commentaries up to and through the Bavli, the Talmud of Babylonia written between the 5th and 7th centuries C.E. (A.D.). In Judaism and Disability, the archaic portrayals of mentally ill, mentally retarded, physically affected, deaf, blind, and other disabled people reflect the sharp contrast they presented compared to the unchanging Judaic ideal of the “perfect priest.” All of these sources describe this perfection as embodied in a person who is male, free, unblemished, with da’at (cognition that can be communicated), preferably learned, and a priest. The failure to have da’at stigmatized disabled individuals, who were also compromised by the treatment they received from nondisabled people, who were directing and constraining. As the Judaic ideal transformed from the bodily perfection of the priest in the cult to intellectual prowess in the Diaspora, a parallel change of attitudes toward disabled persons gradually occurred. 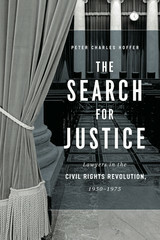 The reduced emphasis upon physical perfection as a prerequisite for a relationship with God eventually enabled the enfranchisement of some disabled people and other minorities. 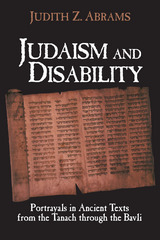 Scholars, students, and other readers will find the engrossing process disclosed in Judaism and Disability one that they can apply to a variety of other disciplines. Now, for the first time, a collection featuring 17 widely respected scholars depicts the everyday practices of deaf interpreters in their respective nations. Deaf Interpreters at Work: International Insights presents the history of Deaf translators and interpreters and details the development of testing and accreditation to raise their professional profiles. 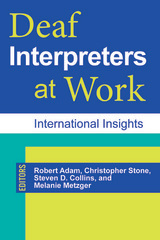 Other chapters delineate the cognitive processes of Deaf interpreting; Deaf-Deaf interpreter teams; Deaf and hearing team preparation; the use of Tactile American Sign Language by those interpreting for the Deaf-Blind community; and conference interpreting and interpreting teams. 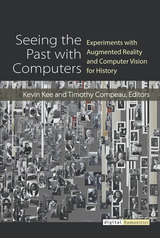 Along with volume coeditors Robert Adam, Christopher Stone, and Steven D. Collins, contributors include Markus Aro, Karen Bontempo, Juan Carlos Druetta, Senan Dunne, Eileen Forestal, Della Goswell, Juli af Klintberg, Patricia Levitzke-Gray, Jemina Napier, Brenda Nicodemus, Debra Russell, Stephanie Sforza, Marty Taylor, and Linda Warby. The scope of their research spans the world, including many unique facets of interpreting by deaf people in Argentina, Australia, Canada, England, Finland, Ireland, Sweden, and the United States, establishing this work as the standard in this burgeoning discipline. "Prepared by a psychologist who works with deaf students and their families, You and Your Deaf Child is handy for advice as different situations arise." --Hearing Health "This self-instructional manual for parents of deaf or hard of hearing children provides practical information and techniques for understanding and dealing with hearing loss." --Exceptional Child Education Resources "It will be invaluable to the parents of children with newly diagnosed hearing loss." --Ear and Hearing You and Your Deaf Child is a guide for parents of deaf or hard of hearing children that explores how parents and their children interact. 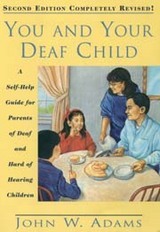 It examines the special impact of having a deaf child in the family. Eleven chapters focus on such topics as feelings about hearing loss, the importance of communication in the family, and effective behavior management. Many chapters contain practice activities and questions to help parents retain skills taught in the chapter and check their grasp of the material. Four appendices provide references, general resources, and guidelines for evaluating educational programs. Once parents have worked through You and Your Deaf Child, this friendly guide can be referred to for specific information and advice as different situations arise. John W. Adams is a psychologist at St. Mary's School for the Deaf and also at The Family Center of Western New York, both in Buffalo, NY. Profoundly deafened as an infant, Don Fulk didn’t learn his name or go to school until the age of ten. When he was eighteen years old and a budding superstar on his football and basketball teams, he broke his neck in a swimming accident, and became paralyzed. After his injury, he was confined to a bed in his parents’ home for eight years, unable to move and barely able to communicate. After his family could no longer care for him, he spent nine years in a nursing home where he suffered from abuse and neglect. Yet through a life marred by isolation and frustration, Fulk endured with strength, humor, and grace. He never gave up pursuing his dreams for independence and self-worth, and improving the lives of others. He fought a system that was unfair and discriminatory, and helped pave the way for people with disabilities to live independently. Don Fulk signed his story to author Janet Allen, describing his difficult home life, the incredible friends who changed his life, and his dramatic escape from an abusive nursing home. 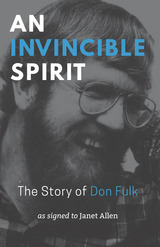 An Invincible Spirit is a story of hope, empowerment, and the battles people with disabilities have fought—and continue to fight—to improve the quality of their lives. Video relay service (VRS) is a federally funded service that provides telecommunications access for deaf people. It is also a for-profit industry with guidelines that may limit the autonomy of the sign language interpreters who work in VRS settings. In this volume, Erica Alley examines how VRS interpreters, or “Communication Assistants,” exercise professional autonomy despite the constraints that arise from rules and regulations established by federal agencies and corporate entities. Through interviews with VRS interpreters, Alley reveals the balance they must achieve in providing effective customer service while meeting the quantitative measures of success imposed by their employer in a highly structured call center environment. Alley considers the question of how VRS fits into the professional field of interpreting, and discovers that—regardless of the profit-focused mentality of VRS providers—interpreters make decisions with the goal of creating quality customer service experiences for deaf consumers, even if it means “breaking the rules.” Her findings shed light on the decision-making process of interpreters and how their actions are governed by principles of self-care, care for colleagues, and concern for the quality of services provided. Professional Autonomy in Video Relay Service Interpreting is essential reading in interpreter education courses and interpreter training programs. The 43 million people with disabilities form this country’s largest minority group, yet they are markedly under-employed as educators. Enhancing Diversity: Educators with Disabilities paves the way for correcting this costly omission. 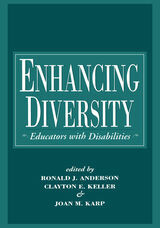 Editors Anderson, Karp, and Keller have called upon the knowledge of 19 other renowned contributors to address the important issues raised in Enhancing Diversity, including the place of disability in discussions of diversity in education, research on educators with disabilities that validates their capabilities, and information on the qualifications desired in and the demands made of education professionals. Legal precedents are cited and explained, and examples of efforts to place disabled educators are presented, along with recommendations on how disabled individuals and school administrators can work toward increased opportunities. Interviews with 25 disabled educators discussing how they satisfactorily fulfill their professional requirements completes this thoughtful-provoking book. In the growing body of research on sign language linguistics, one area of inquiry considers an important component of all sign languages — handshapes — and whether the use of specific kinds increase in direct relation to the ease of their formation. Author Jean Ann provides significant clarification in her book Frequency of Occurrence and Ease of Articulation of Sign Language Handshapes: The Taiwanese Example. Ann employs a straightforward methodology in her examination of the use of Taiwan Sign Language (TSL) handshapes in five succinct chapters. In the first chapter, she discusses the two approaches linguists have taken toward understanding languages, and how these theories have influenced sign language researchers’ consideration of the ease of articulation and frequency of handshapes. In her second chapter, Ann delineates the physiology of hands and explains why certain digits move with greater dexterity than others. Ann applies this physiological information in the third chapter to construct a model for determining the ease of articulation of any logically possible handshape. She divides the handshapes into three categories, ranging from impossible to easy. In the fourth chapter, she applies her model to examine the patterns of TSL, first by describing the 56 handshapes identified in TSL, then determining how often each is used. She then compares the usage data to the handshapes’ ease of formation. The final chapter summarizes her findings and suggests implications of this work that are bound to generate further speculation and study on sign language handshapes in the future. On April 8, 1864, President Abraham Lincoln and the United States Congress put into effect legislation authorizing the granting of collegiate degrees by the Columbia Institution for the Instruction of the Deaf and Dumb and the Blind. At this moment, what became Gallaudet University began a century and a half of offering a collegiate liberal arts education to deaf and hard of hearing students. Featuring more than 250 photographs and illustrations, David F. Armstrong’s The History of Gallaudet University: 150 Years of a Deaf American Institution chronicles its development into a modern, comprehensive American university. At first a tiny college of fewer than 200 students, Gallaudet’s growth paralleled the emergence of the American Deaf Community and the history of the nation in general. In the same way that the country’s land-grant universities brought higher education to more American students than ever before, Gallaudet offered the same opportunities to deaf students for the first time. Gallaudet mirrored other institutions in addressing major issues of the time, from legislated segregation to the Civil Rights movement that inspired the struggle by deaf people to gain control of the governance of their university. Most critically, this volume details poignantly the evolution of American Sign Language as a language of scholarship at Gallaudet during a time when its use in educational institutions was largely discouraged or prohibited. 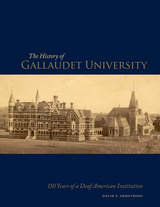 Through story and image, it traces the historic path that Gallaudet traveled to be recognized as the finest institution of higher education for deaf people in the world. Most scholarly speculation on the origin of human language has centered around speech. However, the growing understanding of sign languages on human development has transformed the debate on language evolution. 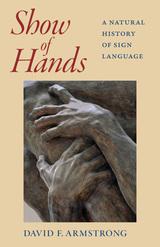 David F. Armstrong’s new book Show of Hands: A Natural History of Sign Language casts a wide net in history and geography to explain how these visible languages have enriched human culture in general and how their study has expanded knowledge of the human condition. Armstrong addresses the major theories of language evolution, including Noam Chomsky’s thesis of an innate human “organ” for language and Steven Pinker’s contention that there is language and not-language without any gradations between gesture and language. This engrossing survey proceeds with William C. Stokoe’s revival of the early anthropological cognitive-linguistic model of gradual development through the iconicity of sign languages. Armstrong ranges far to reveal the nature of sign languages, from the anatomy of early human ancestors to telling passages by Shakespeare, Dickens, and Pound, to the astute observations of Socrates, Lucretius, and Abbé de l’Epée on sign communication among deaf people. Show of Hands illustrates the remarkable development of sign languages in isolated Bedouin communities and among Australian indigenous peoples. It also explores the ubiquitous benefits of “Deaf Gain” and visual communication as they dovetail with the Internet and its mushrooming potential for the future. In 1999, many of today's notable researchers assembled at a special conference in honor of William C. Stokoe to explore the remarkable research that grew out of his original insights on American Sign Language. 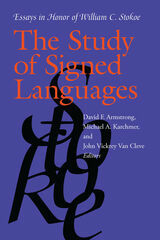 The Study of Signed Languages presents the fascinating findings from that conference. 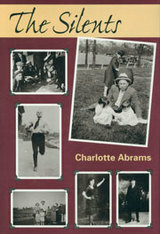 Part 1, Historical Perspectives, begins with a description of the decline of sign language studies in the 1800s. Past research on signed languages and its relationship to language origins theory follows, along with a consideration of modality and conflicting agendas for its study. In Part 2, Language Origins, the first entry intrigues with the possibility that sign language could answer conundrums posed by Noam Chomsky's linguistic theories. The next essay considers how to build a better language model by citing continuity, ethology, and Stokoe's work as key elements. Stokoe's own research on the gestural theory of language origins is examined in the section's closing chapter. Part 3, Diverse Populations, delineates the impact of sign language research on black deaf communities in America, on deaf education, on research into variation in sign language, and even on sign communication and the motor functioning of autistic children and others. In its wide-ranging, brilliant scholarship, The Study of Signed Languages serves as a fitting tribute to William C. Stokoe and his work. Royalties from this title will be contributed to the William C. Stokoe Chair of Ethnographic Studies in Deaf Language and Culture fund at Gallaudet University, Washington, D.C. David F. Armstrong is an anthropologist and Professor of Administration at Gallaudet University. Michael A. Karchmer is Professor in the Department of Educational Foundations and Research and Director of the Gallaudet Research Institute at Gallaudet University. 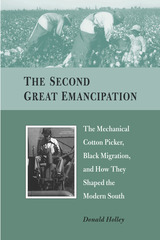 John Vickrey Van Cleve is Professor of History at Gallaudet University.